Now that you have a brainstormed list of product ideas, it's time to take it to the next level. To do this, you'll need to decide which of your previously brainstormed product ideas to further evaluate. In this chapter we will look at how to narrow your product's focus by choosing a niche. In the following chapters, will will then show you how to evaluate your product idea and niche further. At this point you're only selecting a product to further research and evaluate. This likely wont be your final choice. In fact, you may end up further investigating and evaluating dozens of ideas before finally landing on one. There's no science to selecting a product to evaluate from your previously brainstormed list. It really comes down to what you think is the best start point. Is there a product you feel more strongly about? Does one product idea in particular give you a gut feeling that it can do better? Maybe you're really passionate about one of the ideas over all others. Again, it's important to note that there's no right or wrong way to select a product to further evaluate and you can always go back to your list and evaluate your other ideas. As an example for this chapter, we decided to choose and evaluate a product as well to give you context on the upcoming evaluation methodologies. To choose a product, we went back and looked at all the product ideas we came up with in the last chapter. For our product selection process, we decided to put all of our ideas into Google Trends to determine which ones have the biggest search interest/trend. As it turns out, coconut oil and leggings won by a long shot. Note: Google Trends only allows you to compare up to five products at one time, but all ten were compared. We liked the idea of coconut oil in particular. One of the reasons for this was because coconut oil is a raw ingredient and a predominant ingredient in a variety of other products. Remember, coconut oil as a product idea originally came from a Pinterest Pin that linked to an article on 30 different uses for coconut oil. 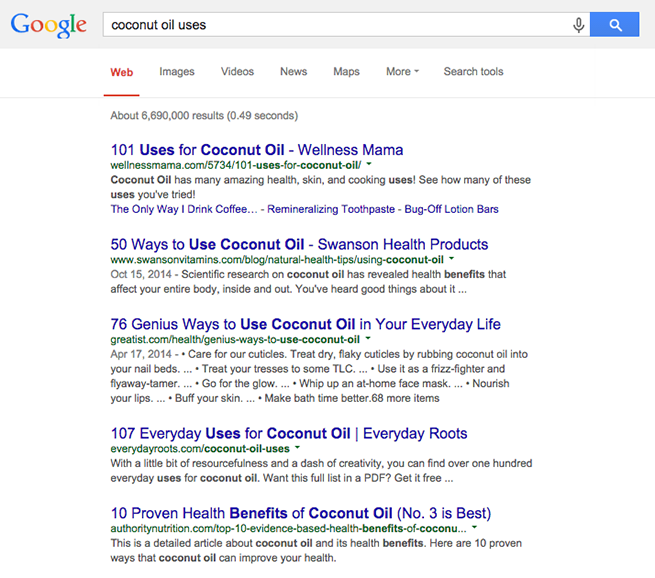 Based on this, we're confident that there's likely some interesting niches around coconut oil. Looking at "Coconut Oil" in Google Trends, we can see that the trend and popularity for coconut oil exists, increasing dramatically since approximately 2011. Based on this information, we've decide to further evaluate coconut oil and see what niches we can derive from it that we can build a successful online business around. Now that you have also decided on a product idea, you'll need to consider a niche in which you want to consider operating in. A niche is just a subset of the market in which a specific product is focused. Your chosen niche will help define possible product features aimed at satisfying specific market needs, the price range for your product, production quality, branding and your marketing. Choosing a niche is a vital part of creating a successful online business. If you try to open and operate your new store in a crowded and popular product category or market, you're going to have a really tough uphill battle fighting against the already established competition. This is precisely why choosing a subset of a market (niche) is so important. Although there's no scientific way to choosing a niche, there are lot's of different methods you can use. From simple Google searches, to building a mind-map to utilizing keyword research to help uncover great niches, there are many ways to build your niche list. In the next section, we will explore a few of them. . Note: Over the next few chapters, you're going to learn how to evaluate and validate your product and niche. If you find in the end that your product isn't viable, you can always go back and choose a different niche. Choosing a different niche can be all the difference between a poor product choice and a great product choice, even more so than the product itself. 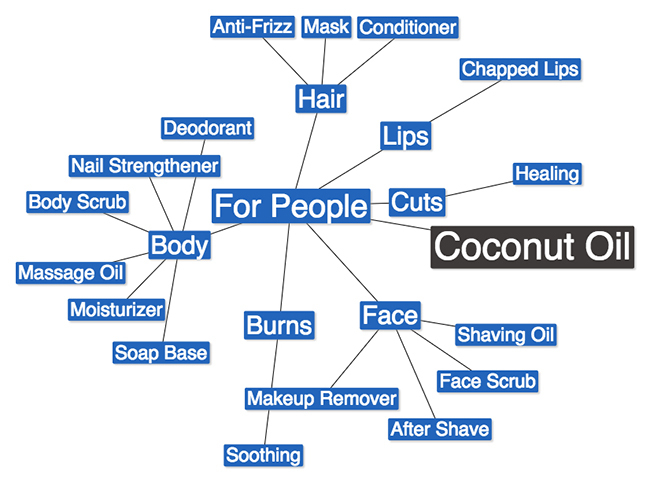 A mind map can be a great way to map out and discover niches for your chosen product. Since mind maps mimic the way our brains think they are a very intuitive way to organize your thoughts and build on ideas. Building a mind map for your product idea can help generate ideas very quickly encouraged exploration of different niche paths. You can use a free online tool like Text 2 Mind Map to create a really simple but effective mind map. You know when you start typing something into Google and it begins to show you search alternatives before you finish typing you query? Well Google is completing your thoughts using the queries most often searched for by other users and you can use this to your advantage to find a niche for your product choice. Google will only show you a few suggestions so you may want to use another tool like Suggester to scrape all the suggestions. To use Suggester, simply enter your product choice and it will give you a list of other queries that people are searching for, along with their popularity. We plugged in our product by searching for "Coconut Oil for" which returned over 300 suggestions we could pull a potential niche from. 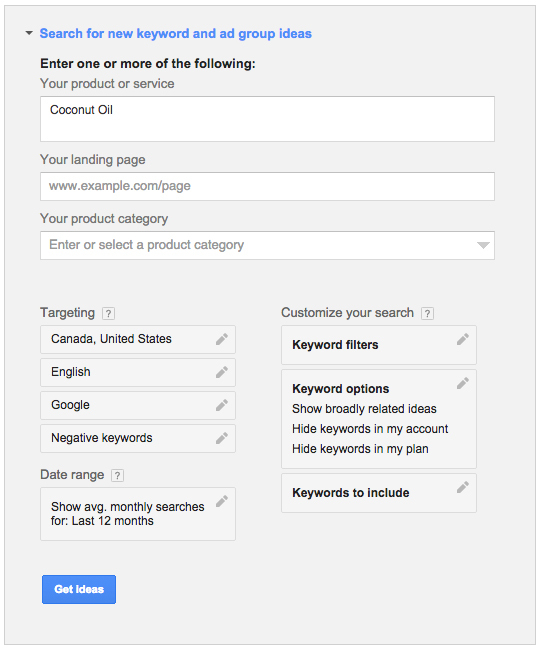 This next method for uncovering a niche uses Google's Keyword Planner tool. 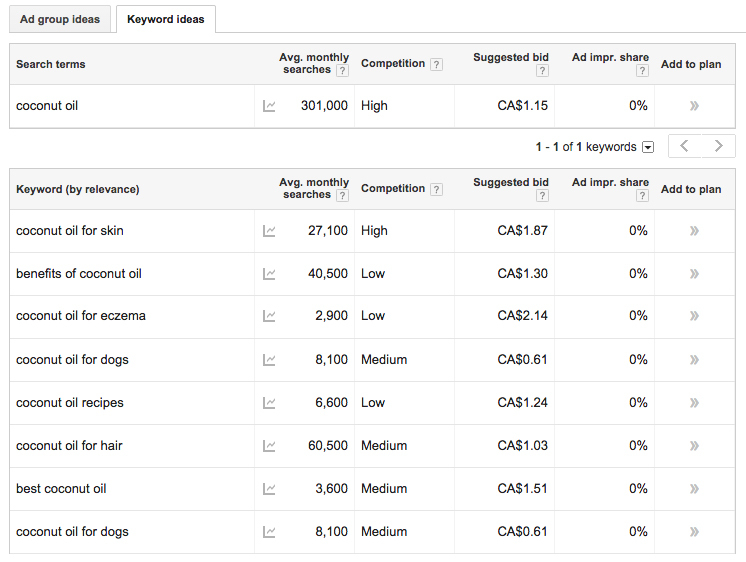 The keyword planner tool is a resource located in Google's advertising platform, Google Adwords. The Google Keyword Planner is similar to the Google suggestion tool we discussed above but is a more advanced and customizable. 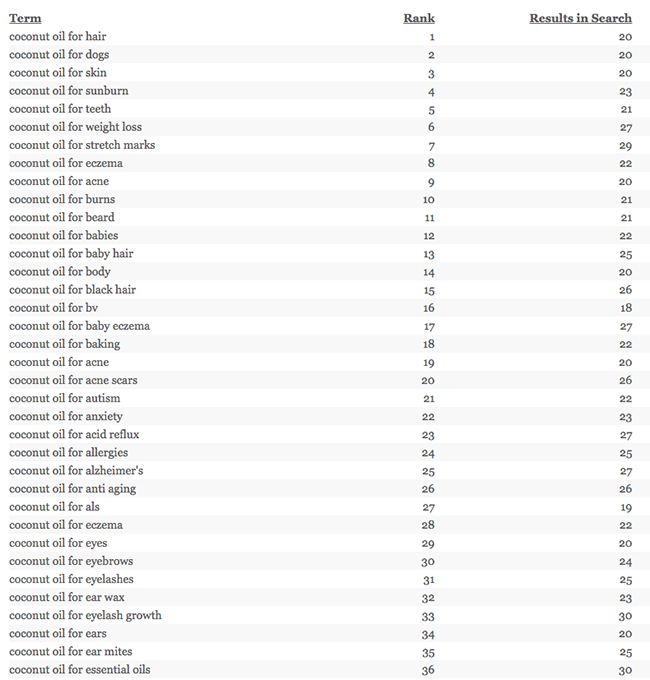 Searching through these results can give you a good idea of potential niches related to your original search term. Don't be afraid to dive deeper and try a variety of related search terms. Now that you have chosen a product idea to further evaluate and have derived a niche from your idea, it's time to evaluate it. Over the next several chapters you'll learn how to evaluate and test your product to better understand and gauge it's potential.